●About Us The WDP-DA29-00020B filter creates better tasting water for drinking and making beverages as well as clean, clearer, healthy ice. There are a lot of pollutants that can get into your drinking water like chlorine, chromium, herbicides/pesticides, oil, gasoline and many more that can affect your health if consumed over long periods of time. Replacing your fridge filter regularly can greatly reduce those contaminants keeping your water cleaner and better tasting. Our current process is using a form of activated carbon to filter out these unwanted pollutants. It's an extremely effective process but overtime you will need to replace your filter. ●When to replace it We recommend every 12 months or sooner, depending on how much you're using the water from your. ●By the manufacturer We provide multi packs to meet your different needs. We focus on quality and service. If you have any question please contact us without hesitation. CLICK THE "ADD TO CART" BUTTON NOW AND MAKE A DIFFERENCE IN YOUR WATER! START DRINKING HEALTHIER, GREAT TASTING WATER WITH WATERDROP PLUS TODAY! DOUBLE LIFETIME: Doubled lifetime than Waterdrop filter, less cost than two Waterdrop filters, less plastic waste, less change frequency, fewer trips and deliveries for purchasing replacements and of course more convenience of your life. INTENSIVE ACTIVATED CARBON: Non-woven fabric perfectly prolongs the lifetime of the filter as well as reduces sediments and many other contaminants. 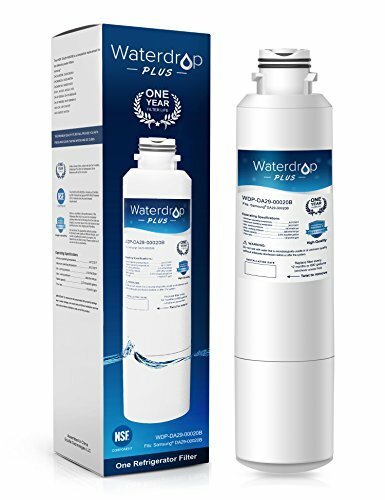 NSF CERTIFIED PREMIUM FILTRATION: Reduces Chlorine Taste & Odor, Pharmaceuticals and other contaminants. YOU PURCHASE COUNTS FOR A DONATION: #Water4Smile We work closely with the Water Project: a non-profit dedicated to bringing clean drinking water to many of the 663 million people without access to it. You Buy 1 filter≈1 Child Gets 1 Day Clean Water. Your participation with the recognition is our maximum support.